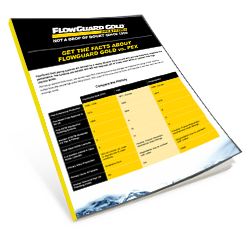 FlowGuard Gold® CPVC vs. PEX Facts | Lubrizol Advanced Materials, Inc.
FlowGuard Gold piping systems are backed by a nearly 60-year track record and provide long-term reliability and performance. The systems are durable and will not degrade, pit or scale, even when in contact with high chlorine levels. PEX has an unproven track record, with several major PEX manufacturers having changed the materials and design of their systems multiple times after several high-profile fitting failures. PEX is part of the same polymer family as Polybutylene, and their track records are shockingly similar. Set the record straight today.